Fourth Row Center: Film Writings by Jason Bailey: On DVD: "Mystery Science Theater XVIII"
When Joel Hodgson and his Minnesota comrades first pieced the show together out of duct tape and leftover props at a UHF station in the late 80s, they certainly couldn’t have guessed that they were tapping into a hidden piece of the zeitgeist—the part of us that (sometimes secretly) revels in having the incompetent and untalented pointed and laughed at. (It’s the same part of us that is fed by Simon Cowell on American Idol, or Joel McHale on The Soup.) All they were trying to do was fill a couple hours of airtime on the cheap, and work up a showcase for their indie-comic sensibilities. Twenty-plus years later, there are two separate prolific continuation/spin-offs (Rifftrax and Cinematic Titanic), and there are these four-episode compilation sets, preserving the classic show in all of its snarky, charming glory. MST3K XVIII continues, as the last several sets have, the wise “Two Joels, Two Mikes” episode selection (creator and original host Joel Hodgson left halfway through the run, leaving head writer Mike Nelson to take over hosting duties; the Internet battle over which was the better frontman rages to this very day). Happily, it dispenses with the insistence, over the last four Shout Factory sets, of including an episode from the inferior first season, before Frank Coniff and Kevin Murphy took over their respective roles of TV’s Frank and Tom Servo and (more importantly) before the show had really found its rhythm and voice. The release of those early episodes certainly pleased completionists—and don’t get me wrong, it’s nice to have high-quality editions of the first few episodes. But as there will probably never be official releases of all the episodes (at least not as long as Sandy Frank has anything to say about it), starting at the beginning and trying to fill in all the holes is rather a fool’s mission. Instead, our first episode is the season two gem Lost Continent, a Robert Lippert special and something of a protypical MST3K episode—a sludge of stock footage, lousy effects, boilerplate dialogue, and C-list actors. Chief target among its cast is Hugh Beaumont, aka Leave it to Beaver’s dad (When he first appears at a rocket launch, Servo muses, “So that’s what Ward does at the office”); Caesar Romero (the Joker to Adam West’s Batman) and Danny Thomas Show regular Sid Melton also appear. The direction is by renowned schlockmeister Sam Newfield, an auteur familiar to the MST3K crew—his previous films included Radar Secret Service, Mad Monster, and I Accuse My Parents. The plot (such as it is) concerns a rescue mission that crash-lands on a mysterious island populated by bad stop-action lizards and dinosaurs, where they do a lot—A LOT—of rock climbing. The plane crash provides some good opportunities for one-liners (“Let’s form a soccer team and eat each other.” “Maybe they landed on a witch and the rest of the movie will be in color!”), but the endless rock climbing sequences are where the episode truly makes its mark. “No one will be admitted during the breathtaking climbing sequence!” Servo announces early on, but as the sequence drags and is padded by endless, dull shots of the crew on the climb, Joel and the bots’ snark turns to anger. “I never knew mountain time was so slow!” Joel despairs. “Will someone please tell the director about compressing time through editing?” demands Crow, who turns particularly nasty (and funny) in this episode. While sharper and funnier than the season one shows, Lost Continent does show the crew still finding their specific style—some of the jokes are obvious, some of the call-backs rather worn out. But there’s an awful lot to like in this one. Though the first two films share many of the same shortcomings, we see a different style of riffing here—the former more general commentary on the shoddy product, the latter more in the style of direct dialogue rejoinder. When one character proclaims “It will be my honor to fire missiles into Poseda, which will save Oficious,” Joel replies, “Love it when you talk that way.” When a character asks Professor Newton where the “little prince is,” Crow shoots back, “That’s a little personal, isn’t it?” And when a particularly terrible fight scene is underway, Servo asks, “So you think Jerome Robbins choreographed this whole thing?” Though a few of the more obscure references are a touch dated (not sure how many people remember Bill Cosby’s You Bet Your Life remake), this is still a first-class episode. Of course, this kind of flagrant incompetence is a comic gold mine for Mike and the ‘bots, who trumpet the film’s “off-camera excitement, the Coleman Francis way” and note, “It is more suspenseful when you don’t know what’s goin’ on,” and finally give it a shrugging “So…. Anyway… You can see how this all adds up to a movie…” Of course, because the film is utter nonsense, there’s little for the host segments to tie in to thematically, so they’re especially random—there is the “11:30 sketch” (which was, reportedly, pretty much a transcription of a daily writer’s room conversation) and Crow’s public service announcement for FAPS, the Film Anti-Preservation Society (“Tragically, films like this are not deteriorating fast enough”). That’s an appropriate response to Beast of Yucca Flats, which is so far removed from anything resembling art or craft, it’s like an import from another world—a “flag on the moon,” if you will. And so on. Both are among the show’s best short films, and a perfect warm-up to the blisteringly terrible film that follows. After the heights (or lows) of Yucca Flats, the fourth film in the set is a bit of a comedown, though Jack Frost (aka Morozko) is enough of an oddity to more than hold its own. Hailing from season nine, the second of the three seasons on the Sci-Fi Channel, this Russian-Finnish co-production came around right about the point in the show’s run where their host channel finally began to relax their insistence that the show stick, very strictly, to science-fiction films. They had tackled these odd folk tales brought to life before (in three earlier episodes: The Day the Earth Froze, The Magic Voyage of Sinbad, and The Sword and the Dragon), and the absolute lunacy of the storytelling provides plenty of sharp fodder (Mike: “So the first plot point is knitting socks. I think we’re in for quite a ride, boys!”). And God knows how goofy our fairy tales must seem to other cultures, but this story seems to have been assembled by insane people; it’s an awful hybrid of Snow White, A Midsummer Night’s Dream, and the Santa Claus story. 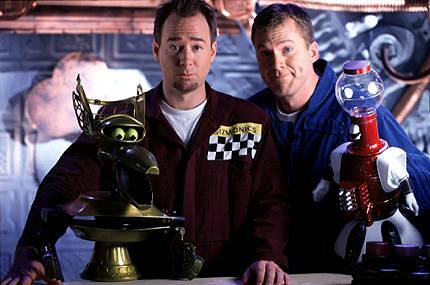 "MST3K XVIII" hits DVD on July 13, 2010. For full A/V and bonus feature details, read this review at DVD Talk.